Pit Stop No8: Meet Delphine! Delphine Quach is a fourth-year mining engineering co-op student at McGill University. She has agreed to share with us her first co-op experience within the mining industry. Hear what she has to say! 1. Why mining as a career option? I always had an interest in geology and I knew that a career in mining would allow to me travel a lot and be part of a global industry. Also, mining offers a combination of both field and office work which appealed to me. After having my first internship my interest grew and I knew I was on the right track. 2. Where have you had your first experience and what were your main duties? My first experience was an eight-month co-op position at the consulting firm Groupe Alphard. I took part in two different projects. The first one was commissioning; I had to make sure along with the team I was working with, that everything was good prior to the commencement of operation at the Bloom Lake mine in Fermont, Quebec. We were testing equipment and machinery. It was a FIFO job (Fly-in-fly-out) so I was spending two weeks on site in Fermont, one week in the Montreal office and then one week off. My second project was more geotechnical: I did some vacuum and ultrasound testing to check that there was no leakage in and out of the tailings pond. 3. Describe a typical day at your job. I would wake up at around 4:30 am get a ready and ride to the mine to be on site at 6 am. The day would always start with several meetings; an internal one where the team and I would discuss the tasks to be done that day and an outer one where we would meet with the client, the construction company and other. My day would then consist in 6 to 7 hours of fieldwork with a lunch break of course. 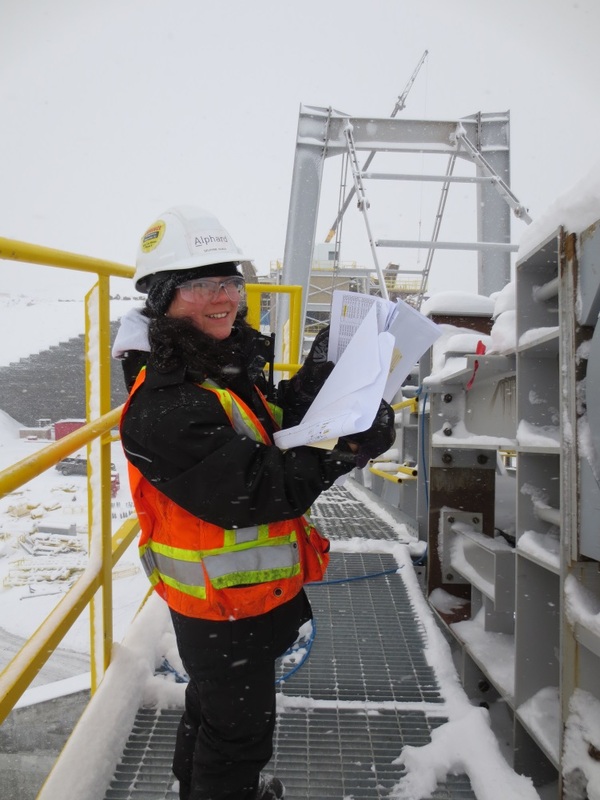 Delphine working onsite in Fermont! 4. What was your favorite part of the job? The combination of field and office work was amazing. The fact that I had the opportunity to interact with a lot of people from different background (construction firm, consulting firm, client, financial people, engineers, technicians) was a great part of my job. 5. What was the most challenging part of your job? The cold! There were days where the temperature would drop as low as -60 degrees and I had to work outside. Not really! The traveling was a bit tiring but you get use to it. 7. What do you think is one of the biggest misconceptions about working in mining? There are more women working in mining than you think! I met a few female technicians driving heavy machinery. At work, there is absolutely no difference between a man and a woman; if you show you have the capacity and ability to do the job then you are fine! It’s safe! In my opinion it is safer to work at a mine than to cross the street. 8. What skills did you most used at the work? Academic knowledge? Teamwork? Time management? It was most importantly communication skills, as I had to talk with so many different people. Also team work and time management are essential. For any employer, time is money so I had to make sure to respect the deadlines. Done with my EIT (Engineer-In-Training) program and perhaps working in project management somewhere in Russia or Australia. Who knows?